Having spent several months of my spare time in 2010 researching turn of the 20th century German biochemistry journals and books on nutrition, I can reveal that several scientists, all working completely independently, came to very similar conclusions. The reason for their exaggerated measurement of the iron content of spinach, and other food, is bad science. They were, amongst several other things, contaminating the spinach in the laboratory with the vessels they used and the charcoal they used to heat it. The bad science mistake was in fact (contrary to the nonsense contained in the myth) spotted by von Bunge in the 19th century and the fact that such errors occurred was disseminated widely by US Professor Sherman in the early 20th century. For a hundred years or more spinach has been (and clearly still is) renowned for its high iron content compared with that of other vegetables, but to the joy of those who dislike the stuff this is quite untrue. In 1870 Dr E. von Wolff published the analyses of a number of foods, including spinach which was shown to be exceptionally rich in iron. The figures were repeated in succeeding generations of textbooks – after all one does not always verify the findings of others – including the ‘Handbook of Food Sciences’ (Handbuch der Ernahrungslehre) by von Noorden and Saloman 1920. Bender’s myth was popularized as being true by Professor Terry Hamblin in the British Medical Journal in 1981 – perversely in an upbeat Christmas article entitled “Fake” about fake academic research. 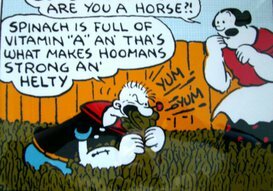 Furthermore, Popeye never ate spinach for iron, his creator E. C. Segar made it the source of his superhero’s strength due to its vitamin A (beta carotene) content. So Hamblin, an orthodox expert, appears to be the first to brace the spinach myth because he did not check the facts behind it. Hamblin has been followed by many orthodox experts all believing the myth to be true and so, with excruciatingly unintended irony, using it as an example of the need to be sceptical of research findings and to check your facts. If ever that old saying “hoisted by your own petard” is very applicable then it is here. 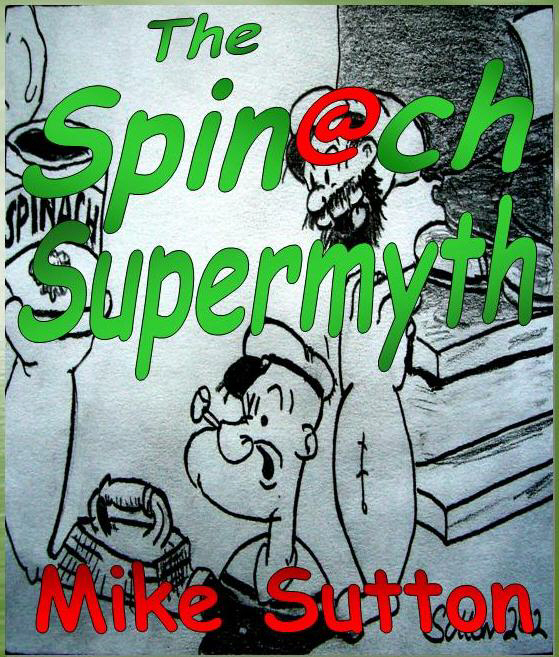 2010 – UK Sutton busts spinach iron decimal error myth – Proving that some German chemists had it wrong in the 1920’s, whilst the German Von Bunge and American scientists had it right much earlier. later it is possible that Popeye comic strips and movies might have accidentally confused the public about spinach being a good source of iron. On Supermyths: Their discovery, distinguishing characteristics and significance. Professor Hamblin sadly passed away on January 8th 2012. As a immunohematologist, Hamblin was a notable and highly respected and regarded researcher and teacher. He is particularly notable as an early pioneer of stem cell treatment for cancer. He made a difference by making the world a better place. I write in my own time and all my opinions are all my own. If you have a problem with anything I write then you'll have to take it up directly with me. How useful is the concept of the smoking gun? What about lots of gun smoke alone?